Papyrs is a web app with a new approach to organizing your team’s information: easily build your own intranet with drag & drop. You can create pages containing notes, documents, twitter widgets, images, discussions, and so on. You can even add custom forms to collect data and process requests. You can share pages with your team, via email or make them public. It’s all very easy to use, so there’s no technical knowledge required! Many of our competitors are aimed at the enterprise market, which makes the products very expensive or complicated. They require technical knowledge (programming, markup languages, etc.) or the user interface is just bad. Other apps are easier to use but too simplistic: e.g. no rich text documents, no online forms to process requests and collect data, no permissions and sharing functionality. 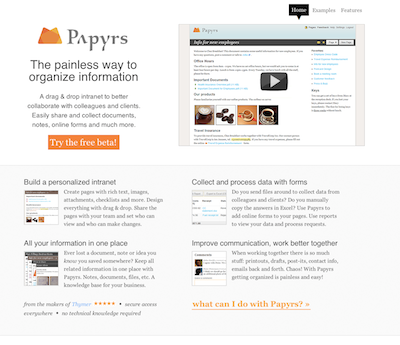 We think Papyrs offers the right combination of flexibility and user friendliness.